Is Trump’s Claim About “millions” Of Voters An Unconfirmed Hypothesis Or Provable Falsehood? A few weeks ago, Donald Trump tweeted that he would have won the popular vote if not for “millions” of votes from illegal immigrants. At the time, Trump did not cite any source, but he was likely referring to True the Vote’s research. True the Vote was reported by Greg Phillips on Twitter and by Paul Joseph Watson at InfoWars. Now, he’s said something similar (again), launching a “major investigation” into possible voter fraud. Predictably, the media are exploding (again) over this claim. Is it true or false that 3+ million people who are not US Citizens voted? This post attempts to tease out this claim and the approach to “fact-checking” it. If so, how many? Millions? If not, how can we know? To answer these questions, we have to examine the evidence. Unfortunately, pro-Trump people don’t demand evidence and anti-Trump people refuse to examine the evidence. It might be possible that some people voted illegally and some illegal immigrants or undocumented citizens voted but not enough to give Trump the popular vote win he so obviously craves. Even hundreds of thousands of illegal votes would have him losing the popular vote by millions. Still, we can’t simply ignore voter fraud if it exists to the tune of hundreds of thousands of votes. Part of the confusion surrounding this conversation is a confusion between a thesis and a hypothesis. Let’s see if we can get clear. Jake Tapper and dozens of others in the media promptly reported that there was “zero evidence” for the truth of Trump’s claim. This conflates a hypothesis with a thesis. A hypothesis is an explanation not a deduction. Technically, “If A then B. B. therefore A.” is an invalid argument form (called affirming the consequent). In practice, however, it is abductive reasoning. Abduction explains a fact (B) with a hypothesis (A). In other words, a hypothesis is a guess that calls for the collection of and examination of evidence or proof. Contrast this with a thesis which is already supported or proven by the evidence. A thesis is a claim already proven by factual premises. A hypothesis is put forward to explain some facts. Only after it is posited do we amass evidence for it. Of course, not all hypotheses are created equal. A hypothesis is reasonable if it is likely true or if there is even a remote possibility of it being true. For example, anyone could hypothesize that there are foreign governments interfering with our democratic process. That is only a reasonable hypothesis if certain known facts can be brought to bear that show the hypothesis is likely enough to deserve investigation. Anyone could hypothesize that there are more planets in our solar system than the currently accepted planets. That is only reasonable if we could also bring to bear considerations that it is possible that a planet-sized object has escaped detection for hundreds of years of modern astronomical observation. By contrast, a thesis would be the claim that there are exactly 8 planets in our solar system. The evidence for this claim is the body of observation and research about Mercury, Venus, Earth, Mars, Jupiter, Saturn, Uranus, and Neptune. Last month, [Pope Francis] told the media to stop spreading fake stories because ‘people have a tendency towards the sickness of coprophagia’. Which means eating excrement. Why did he say it? The traditionalist blog Rorate Caeli suggested that ‘ageing or an underlying medical issue’ was responsible for his ‘persistent anger, rancour, vituperation, use of uncouth words (which is known to be increasingly frequent in private)’. Again, this is an opponent speaking. There is no evidence that the Pope is mentally ill. However, plenty of Vatican employees will testify to his outbursts of temper, rudeness towards subordinates and vulgar language. What the writer means to say is that phenomenon (uncouth talk) can be explained by the hypothesis (mental illness) but that the hypothesis has not been confirmed (“no evidence”). Put differently, the phenomenon is the fact-pattern the hypothesis is invoked to explain and so in the second sense the fact-pattern (uncouth talk) is the evidence. This ambiguity between using “evidence” to mean confirmation of a hypothesis or the facts that call for the positing of a hypothesis in the first place is the culprit of much mischief. A more relevant example is this: “Russia interfered with our election process” is a hypothesis. It has not been proven, and there is not enough evidence to confirm it. If “Russia interfered with our election process” were a thesis, then you should be able to cite the evidence. Russia preferred Trump to Clinton. Russia disrespects U.S. sovereignty enough to try to put their thumb on the scales. Russia had influence over some of the sources that affected the election, such as (a) James Comey, (b) Wikileaks which revealed the depth of corruption in the DNC, John Podesta, and Hillary’s staff, or (c) fake news. Evidence would be some sort of proof that the hypothesis “Russia interfered with our democratic process” either directly or through the release of Wikileaks information. Is Illegal Voting a Good Hypothesis? To return to Trump’s claim that Hillary got “millions” of votes from non-citizens. Is it a reasonable hypothesis that illegals determined Hillary Clinton’s popular victory – or the size of her popular victory? In CA and other states, a driver’s license (needed to vote) does not imply legal citizenship. In CA, the state secretary allows for online voter registration. So perhaps his claim (which is neither confirmed nor unconfirmed) should be investigated. If it turns out to be false, the claim is not a lie but a disconfirmed (i.e., false) hypothesis. If it turns out to be true, well, that still doesn’t mean he knew the right answer ahead of time – it just means he guessed rightly. Despite this indeterminacy, many are mocking Trump for spreading a known falsehood. Phillips would not provide any additional information when asked by PolitiFact. He said he has chosen not to release more information because he is still working on analyzing the data and verifying its accuracy. Phillips would also not say what the data is or where it came from, or what methodology he used. If Phillips does release a more detailed report, we will consider that information. But for now, this claim is inaccurate. We rate it False. To say that, “For now this claim is inaccurate” is almost laughably stupid. That would be like saying, “Suppose that Russia hacked our election. There is no evidence to confirm the hypothesis yet, so ‘for now’ it’s inaccurate.” Claims are not “inaccurate” until proven true, they are simply (unconfirmed) hypotheses. 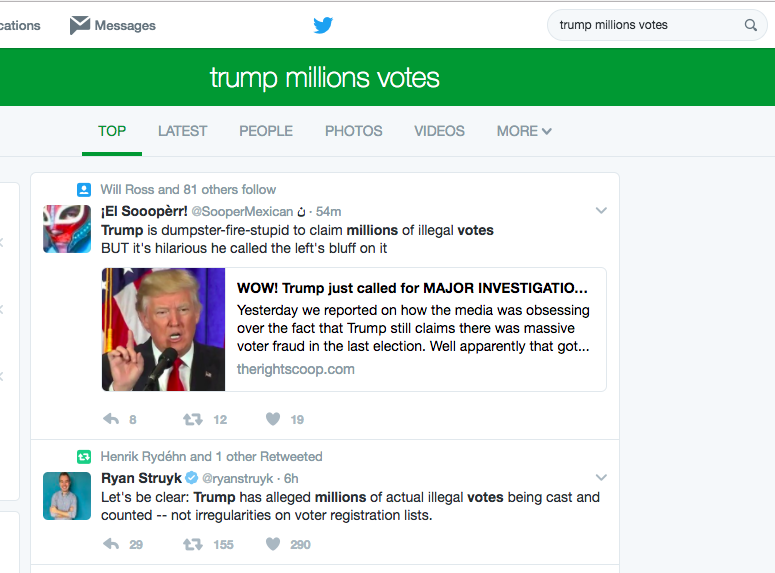 Let’s compare the illegal vote hypothesis with the Russian interference hypothesis again. According to Politifact, the Department of Homeland Security and Office of Director of National Intelligence are “confident” that the Russian government “directed the recent compromises” of emails. That report is three paragraphs released October 7, 2016. It states that the hacked e-mail releases are “consistent with the methods and motivations of Russian-directed efforts.” In other words, they point out that Russian interference is a reasonable hypothesis that has not been proven. There is still no proof to confirm the hypothesis that Russia’s interference affected our election. Likewise, there is no proof that illegals voted by the millions. Both are, however, reasonable hypotheses. John Ziegler at Mediate conducts the exact sort of investigation of the hypothesis that I think is called for. He takes the hypothesis (that millions of illegals voted, or that millions of people voted illegally) seriously enough to work out the math and concludes that there is enough information to disconfirm it. Robert Barns at Law Newz argues that the evidence confirms “a large number” of unqualified persons did in fact vote. Notice that he is not claiming that there is enough fraud to account for “3-5 million” and thus to soothe Trump’s sore ego about losing the popular vote.